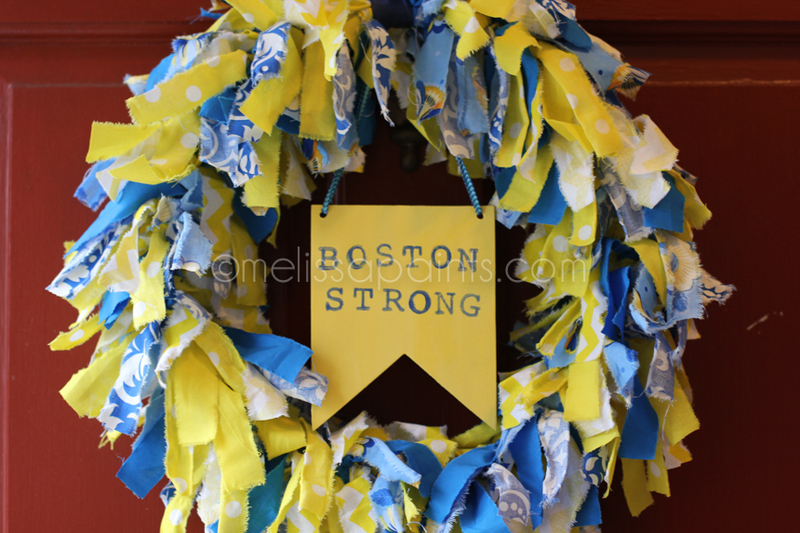 In honor of the runners of the Boston Marathon, I decided to make a wreath in the signature yellow & blue colors of the Boston Marathon. 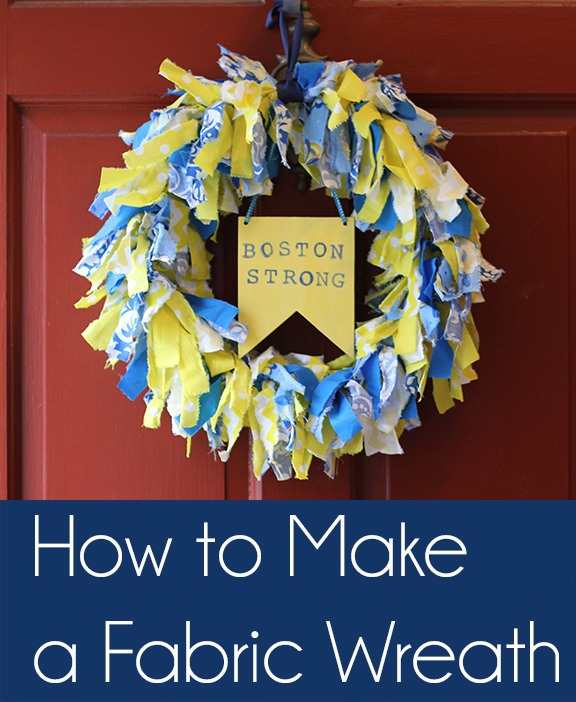 I envision that you could make this wreath in many different colors – red, white & blue for July 4th, pastels for Easter, red & green for Christmas – there are so many options! Six 18″x21″ different-colored/patterned pieces of 100% cotton fabric, like calico. 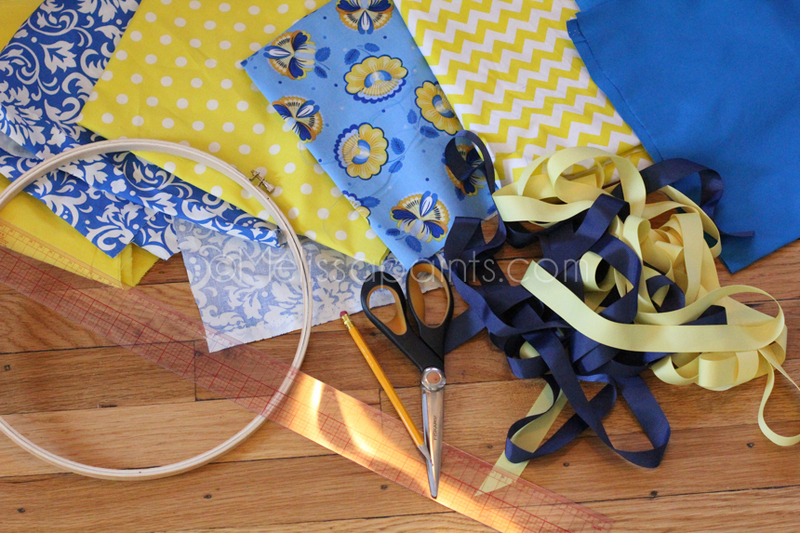 You can use fat quarters or get 1/2 yard cut of each piece (which would be enough for two wreaths). I got a little extra, because sometimes the fabric doesn’t rip exactly where you think it will – see below. 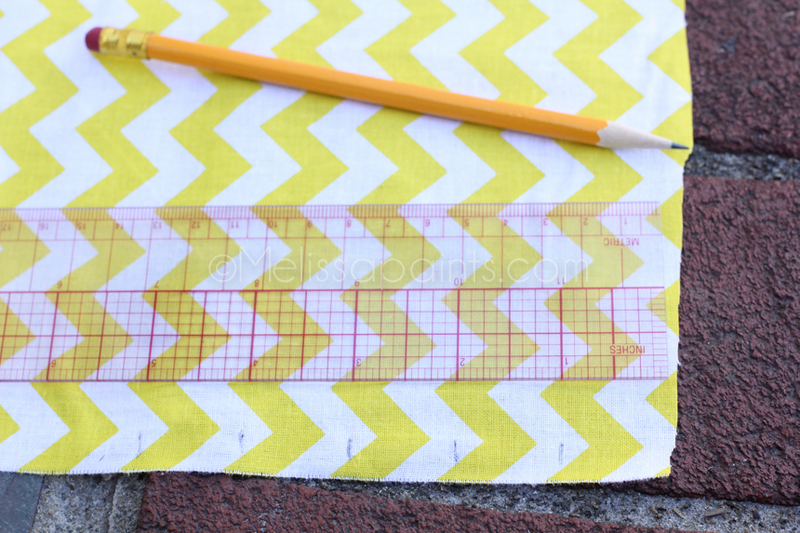 Mark up fabric at 1″ points until you have 18 markings. 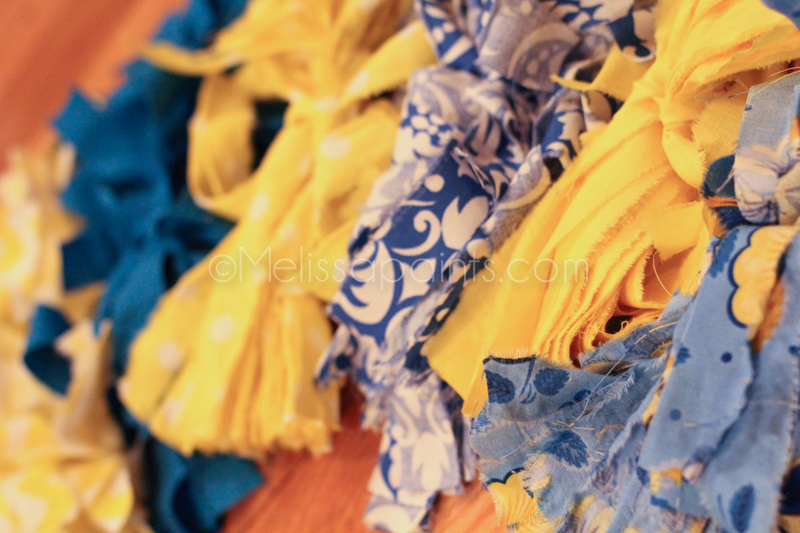 Mark your fabric at 1″ intervals. 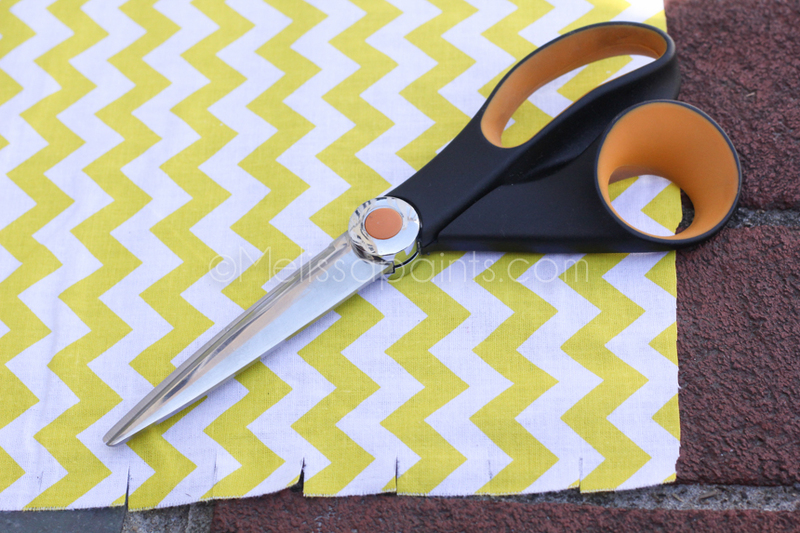 Using sharp fabric scissors, cut 1/2″ into the fabric at each marking. Holding the fabric taught, rip fabric along each cut until you have 18 strips of each of the six fabric patterns. Keep them in separate piles. They will initially be pretty stringy, so you may have to go through and pull out the really “stringy strings.” You will want the raw edge to show. 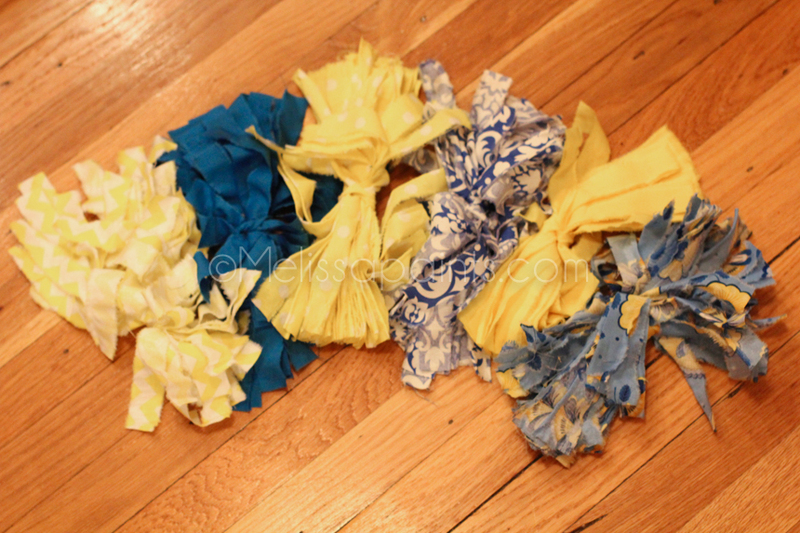 Rip fabric along each cut until you have 18 strips of each of the six fabric patterns. 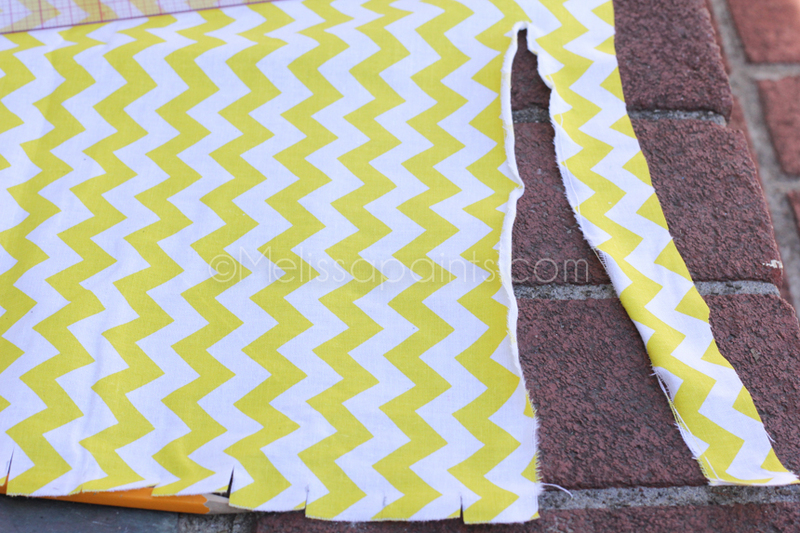 Cut each of the strips in half so that they are at least 9″ long. 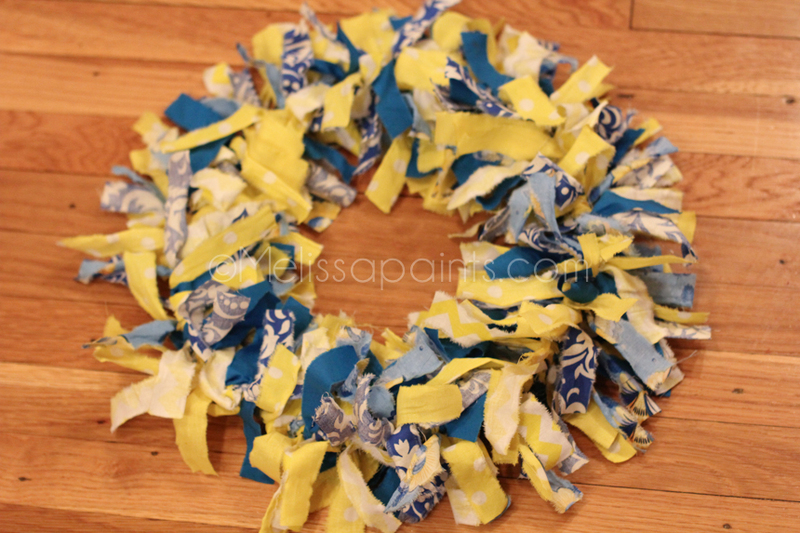 I find that if you go much longer than 9″, the finished wreath isn’t as fluffy. Cut each of the strips in half so that they are at least 9″ long. Lay each of your six piles of strips in a row. 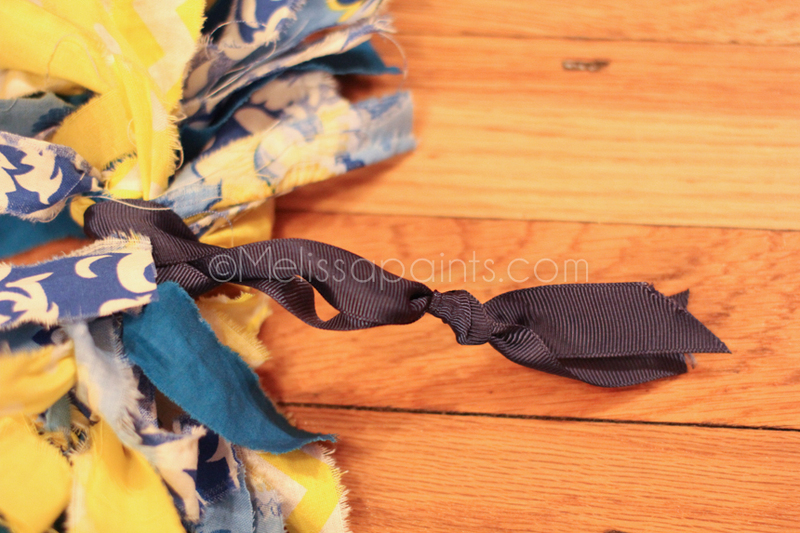 Beginning with the first pile, take a strip and tie a the fabric on the embroidery hoop in a tight single knot. 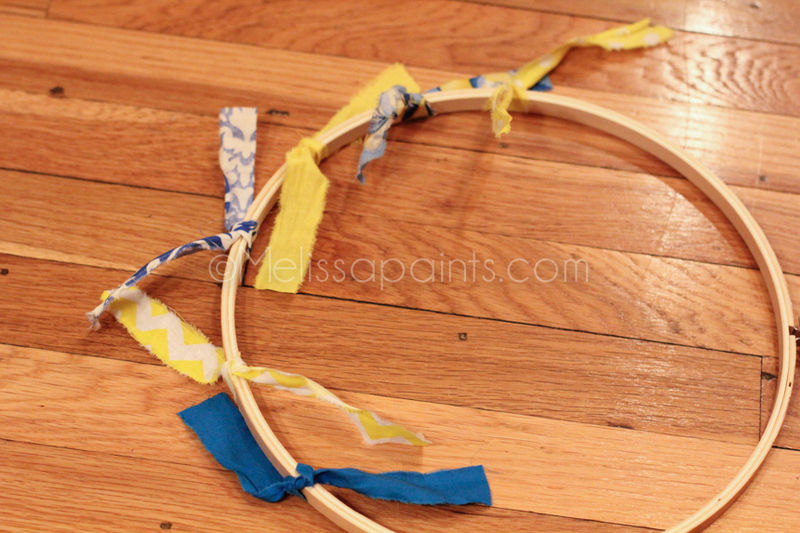 Take a strip and tie the fabric on the embroidery hoop in a tight single knot. Slide each of the six tied strips down the hoop, so that they are next to one another. Twist them a bit so that you are working toward a three-dimensional look. Twist them a bit so that you are working toward a three-dimensional look. Do this with one strip from each of the remaining piles. 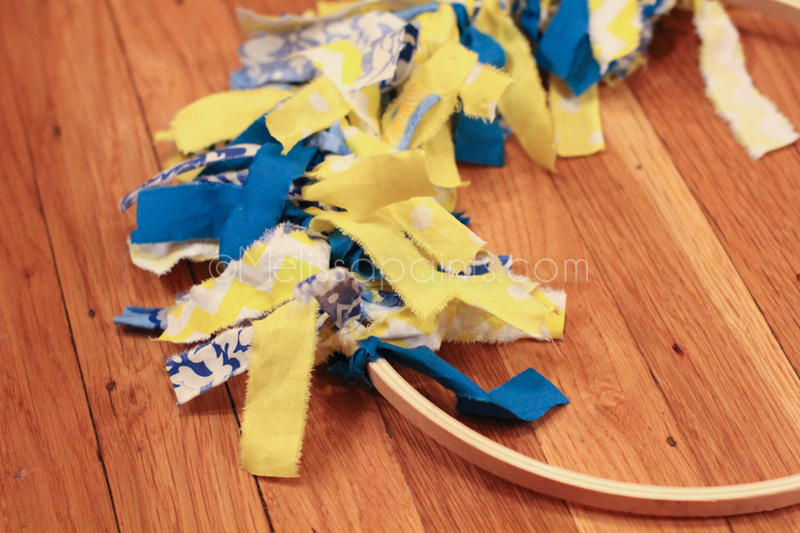 Continue working to tie the strips onto the hoop, until there are no remaining strips. Do this with one strip from each of the remaining piles. Once you are finished, twist and fluff the strips in order to achieve an even, full look. Twist and fluff the strips in order to achieve an even, full look. 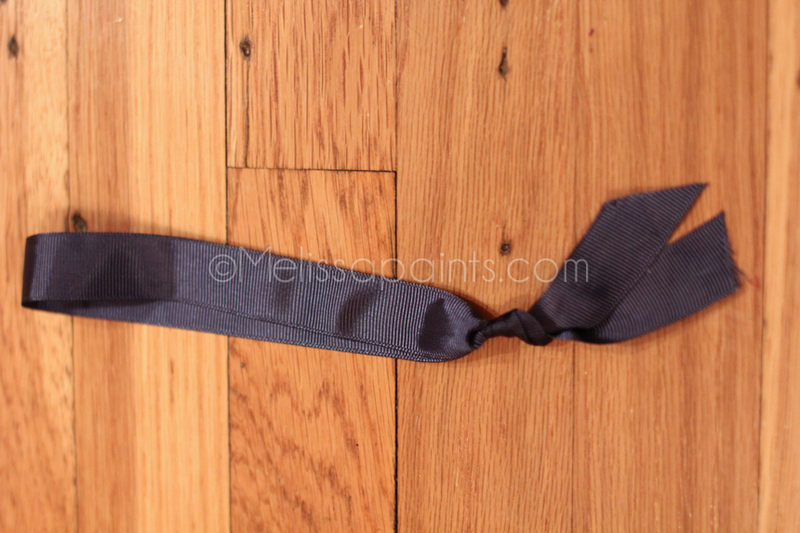 Tie the ribbon so that you have a looped circle of ribbon. 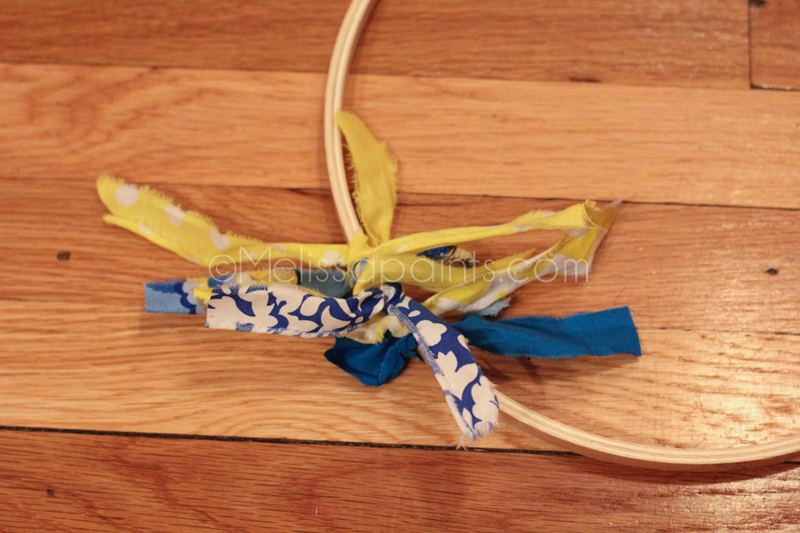 Loop it around the wreath to create a hanger. 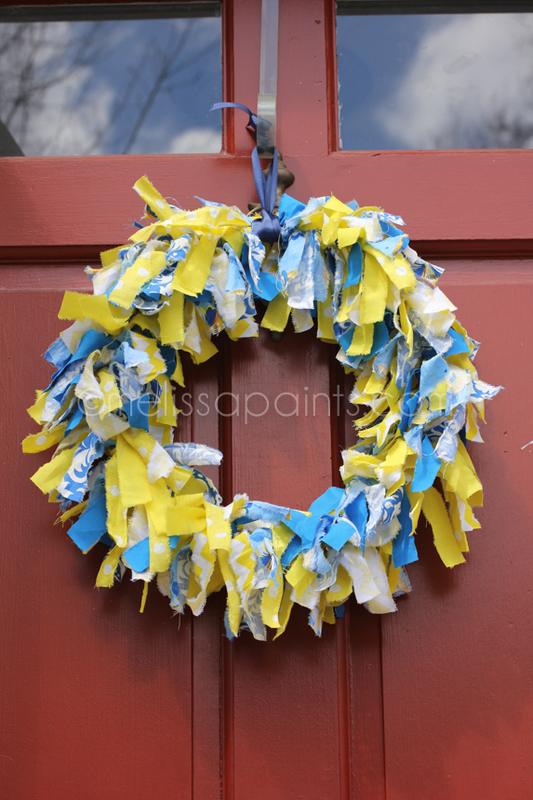 At this point, your wreath is finished. 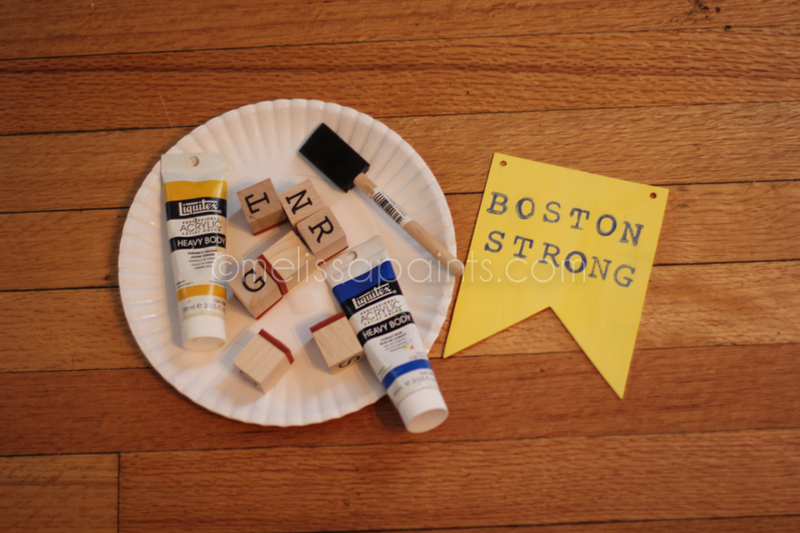 Because I wanted to do a little something extra, I purchased an unfinished wooden cutout, painted it yellow, and stamped it “Boston Strong” with blue acrylic paint. You could do something similar with any kind of message – “Happy 4th!” or “Happy Easter!” or whatever suits your fancy. I used about 1/2 yard of cord to hang it on the wreath.